Looking for some ideas for the Easter basket for older kids? Now that my boys are getting older, it seems like it is harder to fill their Easter basket. The cute toys and chocolate bunnies just don't seem to work anymore. I am glad that the boys still like to color eggs but they still have not acquired a taste for hard-boiled Easter eggs. So my husband and I are the ones who eat way too many deviled eggs and egg salad sandwiches. My boys still have favorite Easter candy that I put into their baskets like chocolate covered Peeps and jelly beans. I also like to treat my boys to some fun new spring toys that they can enjoy into the summer. So I am giving you a sneak-peak into my boy's Easter basket. Keep reading to discover an awesome giveaway. Spring is the perfect time to fly a kite as the wind is perfect. 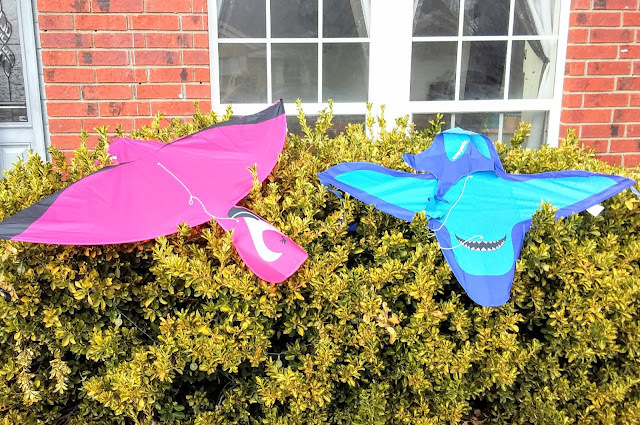 My younger son enjoys kites so the Easter bunny will be some unique shaped kites in the boy's Easter basket. 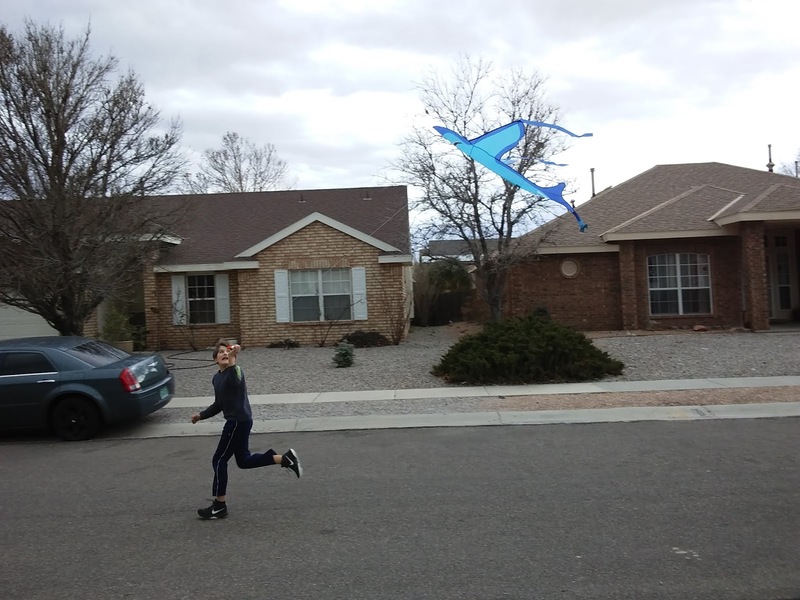 My son really enjoyed his Shark kite from last year and it got stuck in a tree. When my son came into to tell me about the mishap, the wind became strong and the kite took off. So now that my son no longer has a kite, he will be thrilled to find one in his Easter basket. As you call tell from the above picture, these kites from Antsy Pants are fun to fly. They are also very affordable so you can replace them if they get stuck in the tree. I am loving the pink flamingo kite that will also be in the boy's Easter goodies. Why should the Easter Bunny have all the fun hopping around town? With these cute Hoppity Hop toys from Antsy Pants, kids up to 110 pounds can have a blast bouncing around the house. 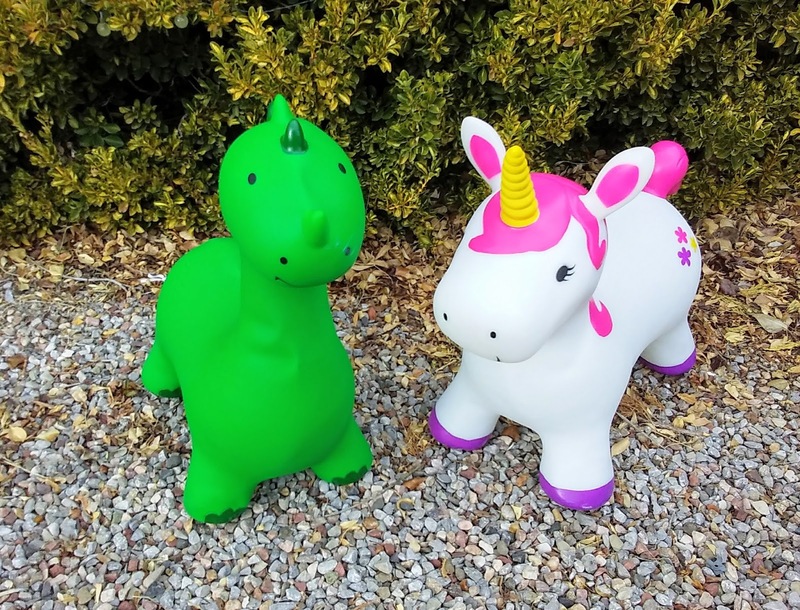 These durable toys can also be used outdoors. The soft bouncy toys are so easy to inflate and kids of all ages can grab the ears for a fun hopping time. Kids can work off all that extra energy from all the sugar that the Easter bunny brings by bouncing around the house. 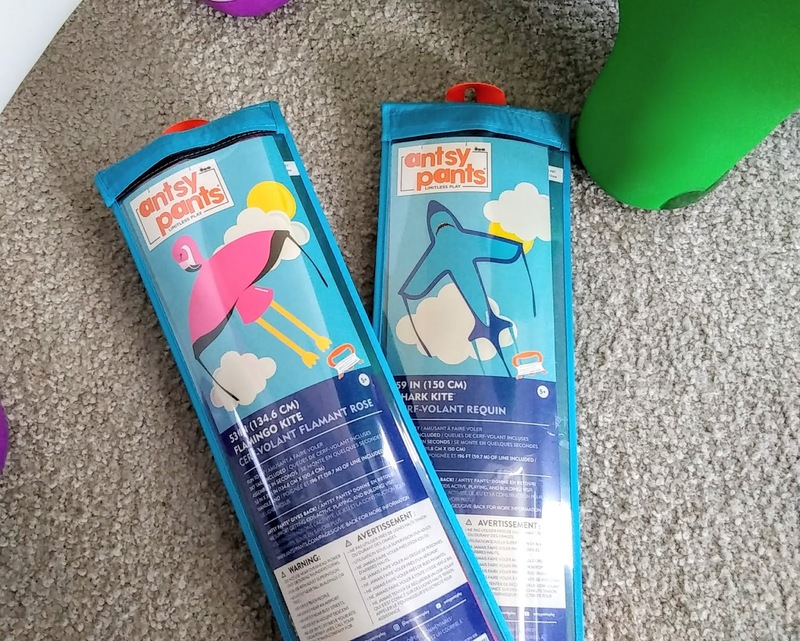 These adorable Hoppity toys and the above kites can be found at Target stores. My boys love baking and this food craft kit subscription will be perfect in their Easter basket. Every month gramma will send them a themed cookie and treat kit that containers 3 fun crafts. 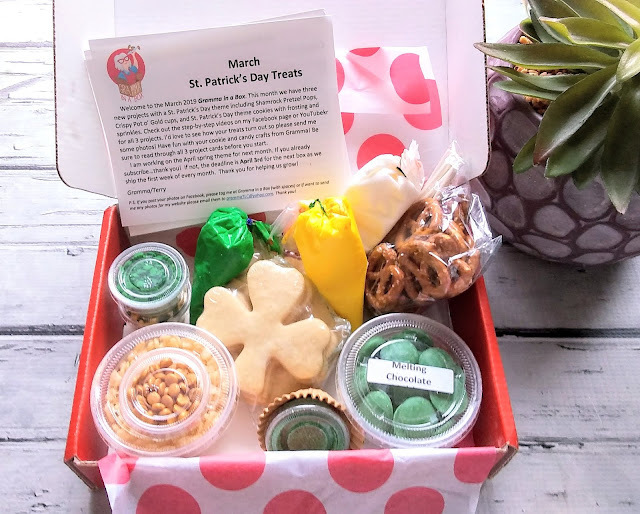 Each goodie box always contains cookies to frost and two other sweet treats that kids can make all by themselves. The cookie kits contain easy to follow instructions that even have pictures on them. The best part for parents is everything is included so you don't have to buy and ingredients. No baking is required either. Some of the past themes for the kid's food crafts have been holiday related, beach themed, and sports related. The Gramma in a Box is a delicious gift that kids will love. 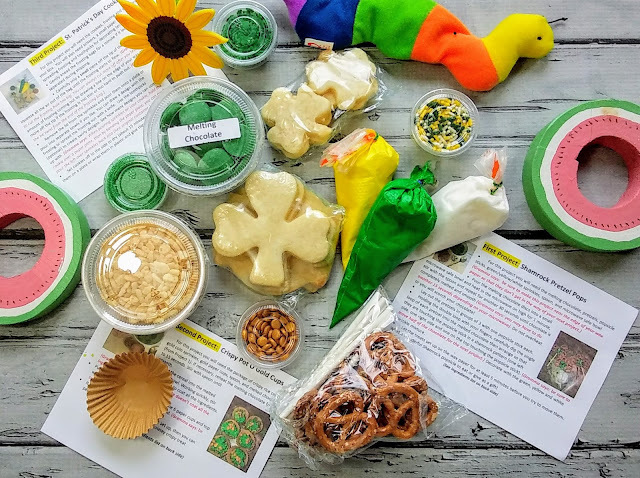 Older kids still enjoy crafts and these Creative Roots Paint Your Own kits come with everything that an older kid needs to make a cool cactus, daisy, or stepping stone. My boys enjoyed making a stepping stone last summer with a different kit but that one required them to make the stepping stone. I am glad that these kids just require painting so that means less mess. Kids can still express their creativity and then proudly display their artwork. Available themes include Daisy, Cactus and Elephant Planter. 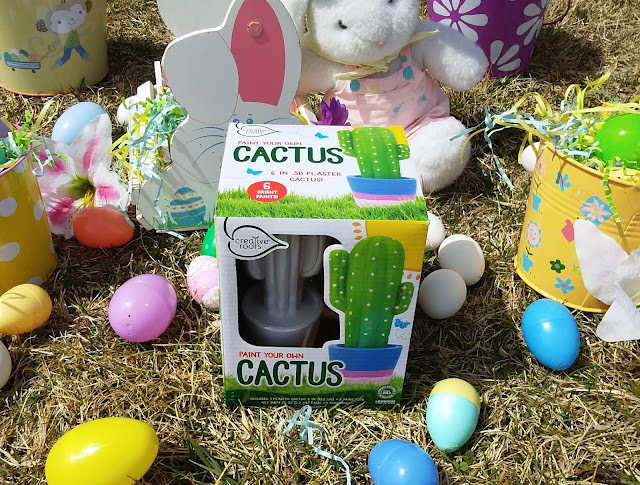 The Easter Bunny will be bringing a Cactus Kit to my boys. 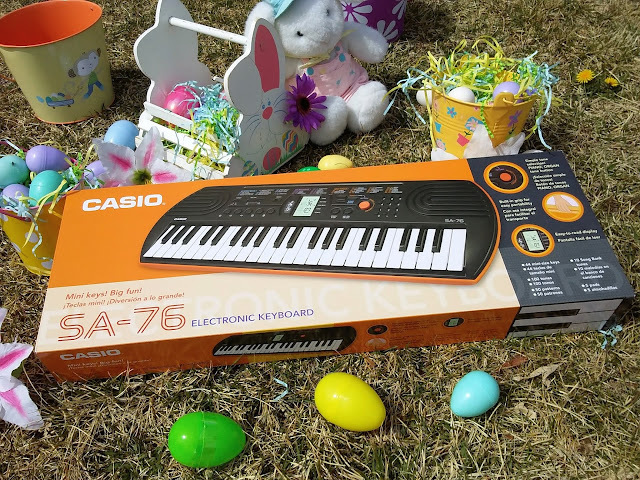 Older kids love music and a Casio 44-keyboard gives them the essentials for playing those first tunes. This cool keyboard is loaded with plenty of extras like 100 tones, 50 rhythms, and 10 integrated songs. So older kids will have a blast making music and since this keyboard has LSI sound source and the 8-note polyphony, it might even sound good. 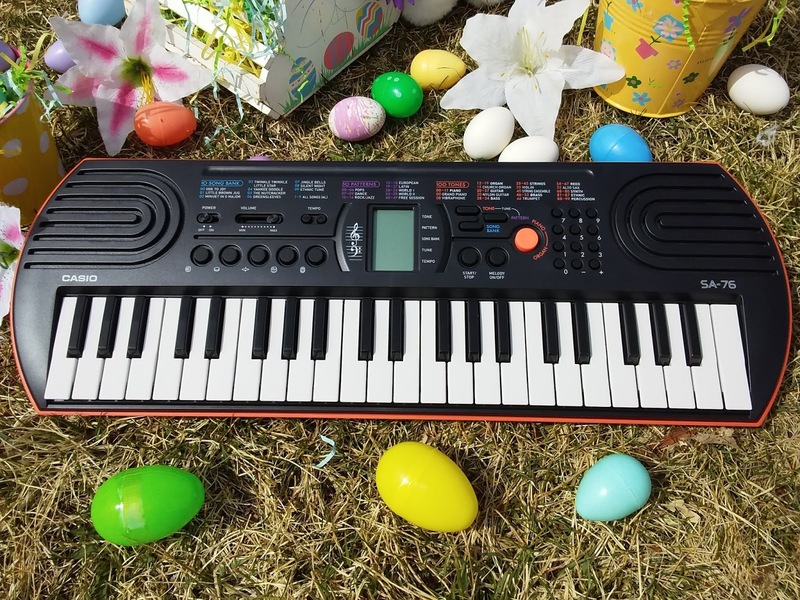 This Easter Bunny present may lead to discovering a music talent in your child. Make sure to enter the Giveaway at the end of this post to win a Casio keyboard. 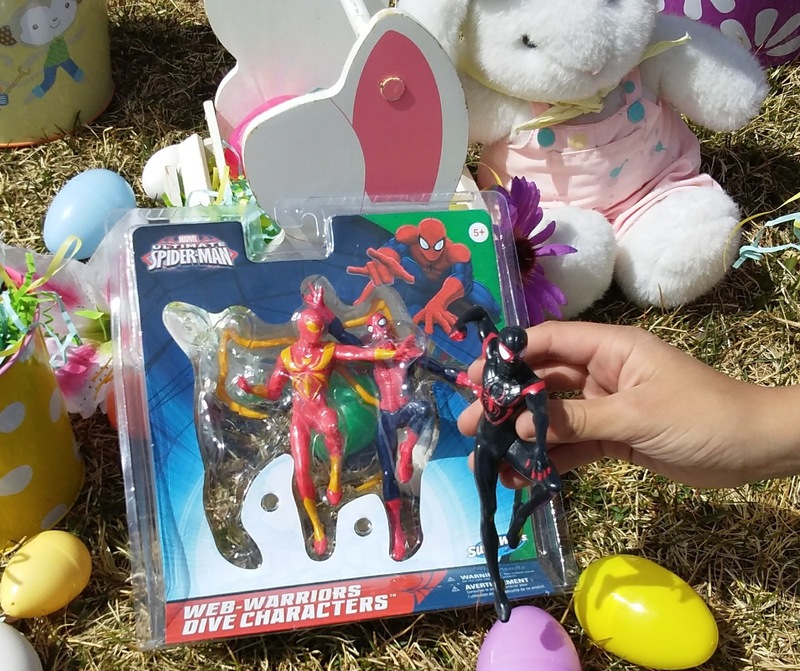 Soon it will time for fun in the swimming pool so these Spider-Man Dive Characters are perfect for the Easter Basket. My boys love playing the water and these dive toys will help them with their swimming skills. Just toss the soft flexible Spider-Man character into the water and kids will have a blast retrieving them from the water. These cool looking action toys are available at Target. Now that my boys are in middle school they need a more advanced calculator to help them with more complex math problems. So I am including a Casio fx-300ES PLUS in their Easter Basket with all the Easter Candy that the Easter Bunny brings. This cool looking scientific calculator features a two-line Natural Textbook Display, which makes it possible to display fractions, exponents, logarithms, powers, and square roots just as they are written in the textbook. It’s also equipped with a repeating decimal display, random integer generator, prime factorization and more. So this will help my boys excel in math class. A recent study found that kids who spend more time on screens tend to be less happy than kids who engage in non-screen activities like reading traditional printed media or doing activities on printed material. I am guilty of letting my boys have too much screen time especially when traveling. 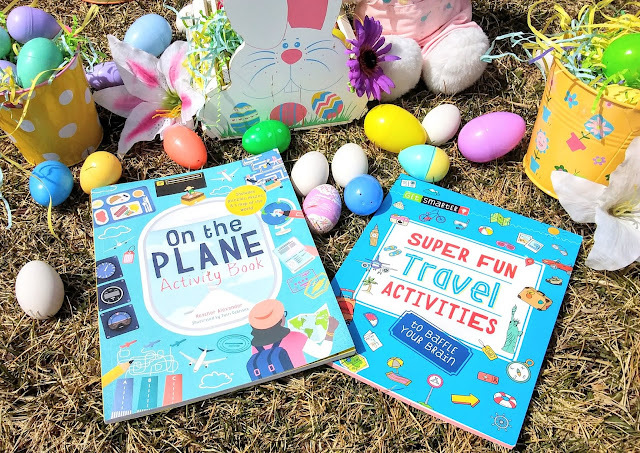 So these travel activity books will be perfect for our summer vacations and more. The engaging and entertaining puzzles, games, activities, and challenges provide the perfect cure for "Are we there yet?" Hours stuck in the backseat will pass quietly and without complaint! Toss in some fun colored pens and kids will have fun while traveling. These activity books will be great for the airport and restaurants too. Do you have a pickle lover in your house? Then they will love these fresh-packed, single-serve pickles and veggie snacks that the Easter Bunny brings. Oh Snap grab and go snacks are a great way to get kids to eat more veggies. They are perfect for lunch boxes and are gluten-free, fat-free delicious single-serving snacks. Give the bunny an extra hand by treating your family and friends to premium dark chocolate treats. 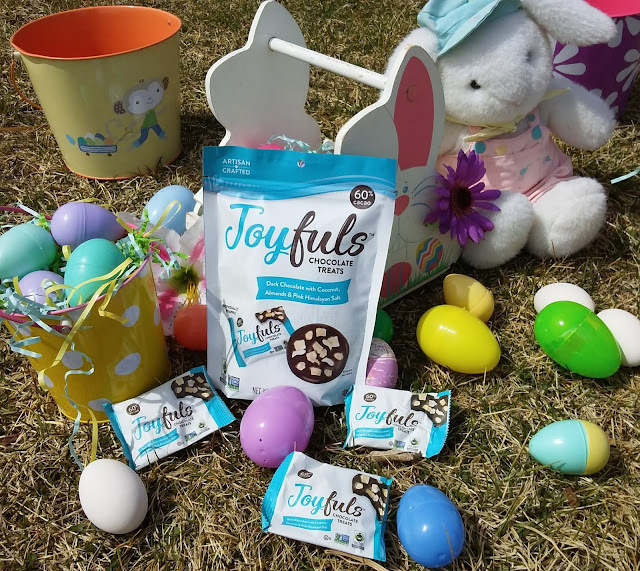 Joyfuls will be a welcome addition to this year's Easter basket. Each individually wrapped treat is crafted with 60% cacao and topped with fruits, nuts, seeds, and Pink Himalayan Sea Salt. It is the perfect mix of sweet and salty. I love that these chocolates are Fair Trade and non-GMO. They can be found at your local grocery stores and many mass retailers. I am so excited that Casio has provided Casio 44 Keyboard for me to giveaway to one lucky reader. Just enter on the form below and good luck! I really like the activity book. Those come in handy so many times. I love the Casio Calculator because a calculator can always come in handy. THe joyful are my favorite. They look so yummy. I love the calculator, the keyboard and the activity books. The Spiderman Dive Characters are my favorite. There are some really great ideas here. I have a 15 yo (today) and I still plan to make up a basket for him. He is my last child. He would love the keyboard and Oh Snap pickles are an awesome idea for a teen themed basket. Besides the keyboard I love the Hoppity Hop toys from Antsy Pants. 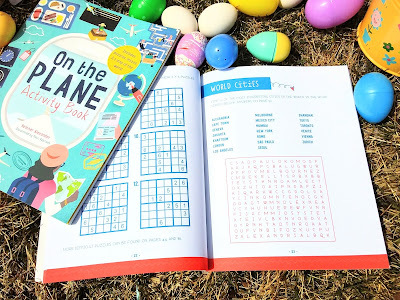 I know with my 5 kids, they need to stay busy so I think the activity books are cool. This is creative and hell lot of innovation which I couldn't think of! Keep it up with the amazing contents! I love those Oh Snap snacks,especially the pickles,big pickle lovers in my house! Ideas that I will copy but not for children, but I am sure they will like it anyway! I like that you have created a selection of fun and useful items for the Easter basket. The kites are so cute, I love them! The kites are my favorite easter item above, thanks! I would like the Joyfuls in my basket! The casio keyboard looks awesome and I'd love to win that! I love the activity books! I think the kites would be awesome for my nephew. The craft kit looks interesting my boy would love it, such great ideas. The activity books. Love the keyboard. Easter is just around the corner and I can't wait! all the chocolate and the egg hunt! loving all the goodies there! These are some cute ideas for things to add to an Easter Basket, I always used to love seeing what was left for me when I was younger. I love these ideas! My daughter would want the food kit box for sure. She loves to bake. My son will probably get cash and subscriptions to his video games. These are really great ideas! My son is in college, but still looks forward to coloring eggs and his basket ever Easter morning. The Hoppity Hop toys from Antsy Pants are my favorite. I like the painting kits. Okay I really want to try the Oh Snap line. Sounds good! These are all excellent ideas! 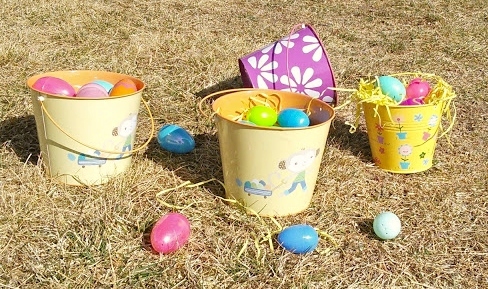 I think the kites are a really cute idea for easter baskets! My favorite is the Paint your own cactus because it keeps kids busy and is fun to do. I needed to ideas for my nieces on basket ideas and this was great. I like that casio and want it . I like the keyboard. I never got anything like that in my Easter basket growing up! I really like the casio keyboard and the elephant to paint. The travel activities would be so perfect for my grandsons as they travel to Minnesota often to visit their other set of grandparents. My favorite basket item is the Airplane activity book. We are a trailing household and fly way too often. Our poor daughter is SUCH a trooper. I always try to find good items to keep her busy while we travel, it was super hard until now. Now that she's learning to read, I'm hoping she gets more into books and games. It's true that as kids grow, chocolate bunnies impress them no more; they want serious stuff! Painting and baking with the kids would be so awesome! And also, playing the piano; we do that at home. Hahaa Hopping hop bunny is so cute thing. Gift round of baking items is nice one too. I like kite flying, it's fun for everyone. Send Easter basket to your friends, and share the joy of this holiday. It's a tie between the cactus craft and the casio keyboard. Thank you so much for hosting. Have a happy Easter! Found your post the moment I was wondering what to do this Easter. Really useful for me. Thank you. Those fun snacks look tempting. I think the best gift is the kite. I have not made or flown a kite in so many years. It is such a great way to get kids to burn energy as opposed to just sitting indoors all day long. I Love the keyboard and the calculator. I always loved getting a basket from my parents. I got all kinds of cool candy! I like the Joyful Chocolate Treats. I like the Oh snap pickle products. We would love the green beans! I love the cactus basket! We used to have a Casio keyboard as well growing up, my sister was more musically-inclined than I was though! That's a great giveaway! I like the idea of choosing unique treats for an Easter basket. All the "Easter" stuff draws you in to that aisle at the store -- but there is so much better stuff out there! I love the summer travel activities book. The kids get so bored in the car, this would be a huge help! I love the travel books and the eggs. I like the travel activity books. The perfect non food Easter basket filler. I love the sounds of the Dilly bites!!! Pickles are the best. The Casio Keyboard is my favorite -- my granddaughter would love this basket! I love the activity books! they look so fun! My favorite is the Hoppity Hop toys from Antsy Pants. They are so cute! I miss the time in which my kiddos did the egg hunting! I adore your grandma boxes! My favorite is the food craft kit subscription. My favorite is the super fun travel activities book. I think the Elephant Planter is super cute! Creative Roots Paint Your Own kits are my favorite item. my kids have been asking for a keyboard. I like the kites! Such a fun activity. I love the Antsy Pants Hoppity Hop toys. My grandchildren would really enjoy them! My favorites are the Hoppity Hop toys. I love the painting kits, the keyboard and the activity books. The travel activity books are my favorite. It gives the kids something to do while in the car. The Hoppity Hop toys look like a lot of fun! I really like the Joyfuls. I like the travel activity books the best. the Casio keyboard is my favorite item. my daughter has been asking for one since her birthday last September she would be super happy if we win. thanks for the chance! The keyboard is my favorite. Thanks for the giveaway! My favorite is the food craft kit subscription! I like the travel activity books. The keyboard and actions figures are my favorite. I also like the activity books. Great ideas! My granddaughter would like the Spiderman charactes. I think my kids would love that keyboard. 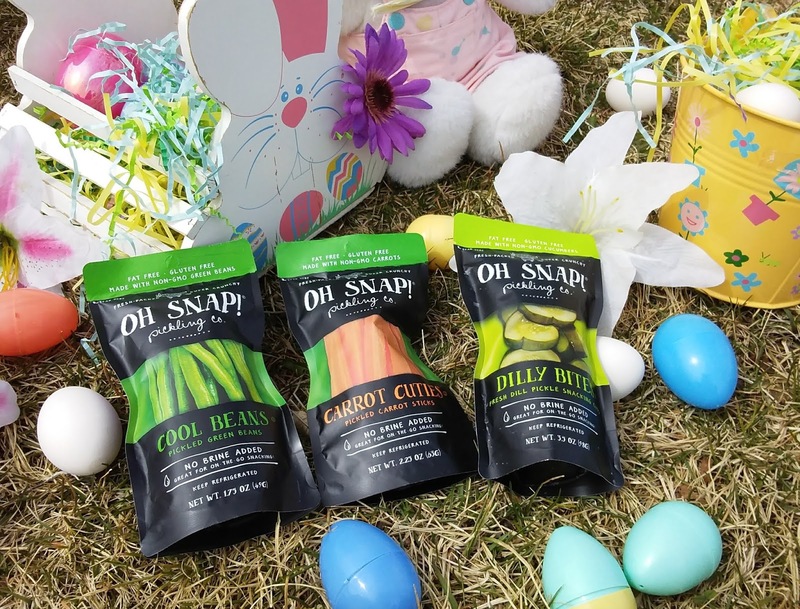 I love the idea of savory snacks in an Easter basket! 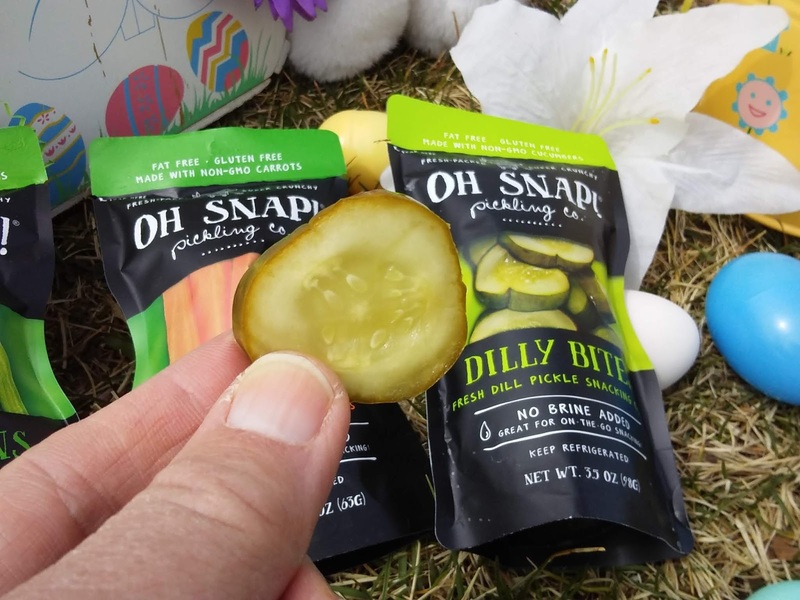 The Oh Snap pickles would be perfect for my sons Easter basket. I like the idea of adding pool toys to Easter baskets. Has me thinking of all kinds of swim-related items that would be cute gifts. I love the casio calculator which my oldest will need for school in September and the casio keyboard that my 12 year old wants to play in band and she needs one at home to practice. I love the paint kits! 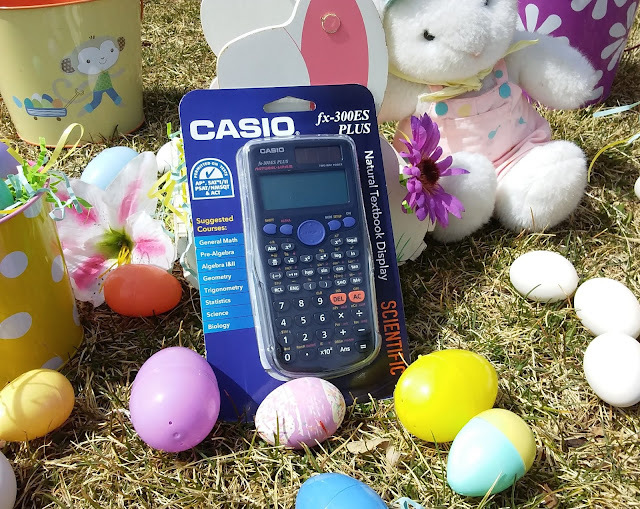 I love the Casio fx-300ES PLUS because my daughter needs it for school. I like the Creative Roots Paint Your Own Cactus. Looks like fun! The Casio keyboard is my favorite. I love the Oh Snap snacks. Let's go fly a kite! Very fun to do. I love the Spider-man dive figures. My youngest would love the pickles! I love the Hoppity Hop toys from Antsy Pants! My kiddos would have so much fun outside with them and I like to get them out for some fresh air toys! I would say the Joyfuls and the keyboard. Joyfuls look delicious and fun! Happy Easter! My favorite item would be the kite. This is such a great idea and the perfect time of year to use it. 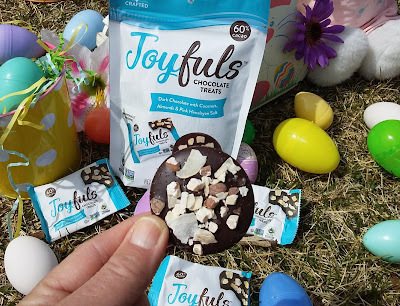 My favorite Easter basket idea are the chocolate Joyfuls. Aside from the keyboard (obviously) I love the single-serve pickles! My son absolutely loves pickles, and would be thrilled to get those. I think the Gramma In A Box would be fun to do with the grandchildren. Thanks! The Flamingo kite is my favorite! How much fun! The Joyfuls treats look very good! My grandson would love the Spider-man dive toys. Thanks for the fun giveaway! I like paint your own cactus! Hoppity Hop toys from Antsy Pants,is so cute my kids would love playing on it . I think that the kites are really neat. My favorite item is the Spider-Man Dive Characters.